Paris eGuides MP3 suite is a package of 18 MP3 audio tracks with an ebook and map routes to dicovers the famous quarters of Paris with your Mobile phone or any MP3 audio player. File size : 40 Mb. 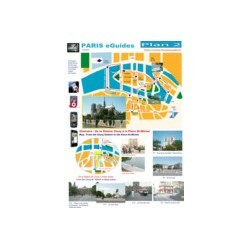 Paris eGuides MP3 suite is a package of 18 MP3 audio tracks with an ebook and map routes to dicovers the famous quarters of Paris with any Mobile phone or any MP3 audio player. You need to transfer the audio tracks to your device and print the map route to start your wonderful of discoveries inside Paris while walking and listening to the speaker voice and a nice music background.
. the Cluny Museum which was the palace of the first king of France, Clovis, after he won the ware against the empire of Roma who was there during many centuries .
. the Institut de France and the romantic Pont des Arts (nice bridge). Enjoy the romantic promenade close to the Seine river and the two famous islands of the city.